Kanbanize 5.13 introduces a new Initiative widget that shows all Initiatives, which are currently “In Progress”, directly on your dashboard. You can activate the new widget from the retractable menu at the bottom right side of the dashboard via the “Add Widget” button. Upon selecting the “Initiatives In progress” widget, the panel will prompt you to choose the boards with initiatives you want to visualize at the entry point of your account. The new widget will display all selected boards in separate blue sections along with the corresponding Initiatives, which are in progress. You can add other boards to the widget using the Selected Boards option in the menu. Kanbanize 5.13 introduces further enhancements to the Advanced Search panel. It now provides you with the availability to display search results in a Kanban view mode and has an extra tab in the refine search criteria named "Work Item". If you filter your account data to get all items (both cards and initiatives) on a given board and select the Kanban view mode, your results will be represented visually on a Kanban board view. This allows you to see the current state of every piece of work. With the help of the Kanban view mode, you can easily get an idea about the progress of a project and the distribution of your work items in the three main Kanban sections: Requested, In Progress, Done. Moreover, you can create a public filter and send it to external stakeholders who do not have access to your Kanbanize account. 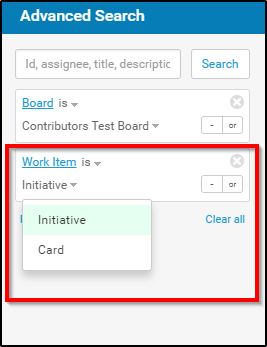 The "Work item" tab in the Refine search criteria panel complements the Kanban view mode feature, as it enables filtering of your work items and gives you the option to select either cards or initiatives. This allows you to narrow down your search and displays just the Initiatives or only the Cards in the Kanban view mode. In Kanbanize, you can send a message from the card to a registered Kanbanize user via the "@" symbol in the description or comment section. The user who has been mentioned receives an email with the message itself, the card details and the name of the notifier. With the new release, all users will be able to set up their personalized board notifications and disable receiving emails sent through this feature. Kanbanize 5.13 is introducing a very easy way for the Administrators in the account to see at a glance all boards to which a user is assigned. The new feature is located in the Registration Members settings of the Administration user management tab. The "Assigned Boards to user" panel provides a list of all boards in your account. Those to which the user is assigned are check marked. 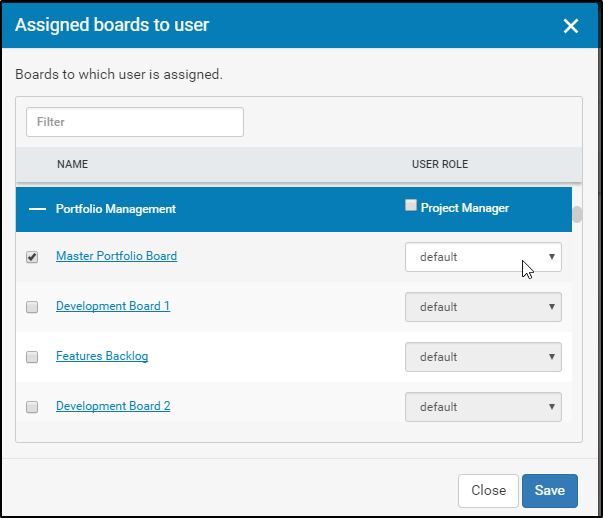 From the same panel, you can easily assign the user to other boards and immediately define their role from the panel. Projects' names in the panel are separated in blue sections, in which you can grant a user with a "Project Manager" privileges for the Project. Release 5.13 improves your user experience by providing new steps in the tutorial for the blocked/unblocked functionality in the portfolio scenario. In addition, all tutorials available in My Account menu have a new and a better looking design.